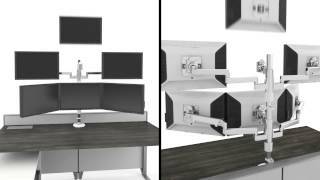 Secure your screens and enjoy more desk space with the Humanscale M/Flex Monitor Arm - Three Monitor Solution. You'll have all of your monitors at much more productive viewing heights in no time, while keeping the freedom to expand to up to six monitors if you need to add more in the future. Each arm holds screens up to 20 pounds. Get ready for configurable ergonomics for monitors that's made surprisingly simple thanks to Humanscale. The M2.1 Monitor Arm has a simple design with fewer moving parts than the average monitor arm. Fewer parts mean there is less likelihood of wear and tear or breakdown. Additionally, the dynamic M2.1 M/Flex utilizes a mechanical spring rather than a gas or hydraulic mechanism, reducing chance of failure. The Humanscale M/Flex Monitor Arm is available in three modern finishes. Select from polished aluminum with white trim, silver with gray trim, or black with black trim. The Humanscale M/Flex Monitor Arm is designed to mount to a multitude of surfaces. Clamp, bolt-through, slatwall, c:scape and direct wall mounts are available. A combination clamp and bolt-through mount is also available. 12'' and 18'' high posts are available for the Humanscale M/Flex Monitor Arm, allowing for additional height adjustment along the post if desired. Monitors attach directly to the Humanscale M/Flex Monitor Arm with a VESA plate adapter. Most monitors come with a standard 100 mm x 100 mm VESA adapter, but larger or older monitors may have different sizes. Please check with your monitor's manufacturer if you are unsure what size plate your display requires.